If you think your tap water is safe, think again. 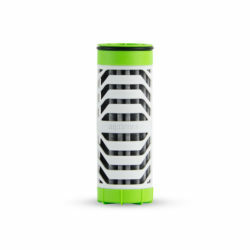 Protect you and your family with the most functional lightweight daily filtration in the world. 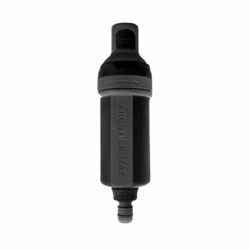 Use the Chemical filter in any Series IV system (such as the Shift Bottle and Cap) for protection from chemical contamination in our municipal water supplies. Every day there is news of another chemical contamination in our municipal water supplies. Recently the EPA identified a new class of “Emerging Contaminants” known as perfluorinated compounds. (PFAs and PFOSs) These compounds can be harmful in concentrations 1 million times smaller than many well-known contaminants such as lead and arsenic. The BLU Line Chemical Filter has been tested and shown to reduce these emerging contaminants to acceptable levels set by the EPA. It is easy to protect yourself and your loved ones with the Aquamira BLU Line Chemical Filter. Aquamira recommends replacing the BLU Line Filter every 90 days, (during continuous use) or after a prolonged period of storage. Protecting your Thirst extends far beyond the backcountry to include your daily activities. 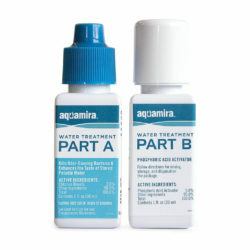 The Aquamira Series IV BLU Line Chemical filter is the perfect choice for Daily Protection from chemical contamination. Unlike many "tap water" filters that only protect you from bad taste and odors, the BLU-Line chemical filter reduces chlorine, chemicals, bio toxins, VOC's, Lead and other heavy metals, and it addresses the whole new category of Emerging Contaminants including PFOAs and PFOSs. Oh yeah, it also improves taste and odor and is lead free, BPA free and phthalate free. 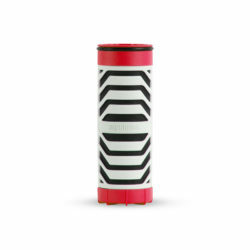 The BLU-Line Bacteria filter is built in America using materials that meet or exceed NSF-53 standards for material safety and is designed for High flow and low pressure drop for easy drinking. Aquamira Series IV BLU Line Chemical filter is deigned to fit into any Aquamira Series IV device (such as the Frontier Max, or SHIFT vacuum insulated water bottles) and will deliver 50 gallons of smooth great tasting, filtered water for everyday use at your office, home, gym or daily activities where chemically safe hydration is a concern.